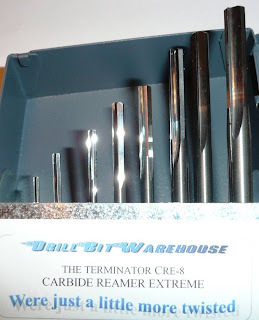 " Worlds Best Set of Reamers! " Micro-grain solid carbide, cryogenically treated. Set is designed for reaming super abrasive work hardened materials. Hard steels up to RC50 and exotic metals, boron, titanium alloys, aluminum, brass, bronze and even acrylics and plastics. Tolerance 0.0000 /+ 0.0002 amazing product. Chucking Reamers, 4 Flute sub-Micron with 10 percent cobalt additive. Super close tolerances. You've tried the rest, Now own the Best! We manufacture over 900 submicrograin carbide reamers - Sizes from 0.0280 to 1"